“GET off the video games, and get out onto the field.” So comes the advice to the pupils of Caherdavin Boys National School from two Limerick senior hurlers. 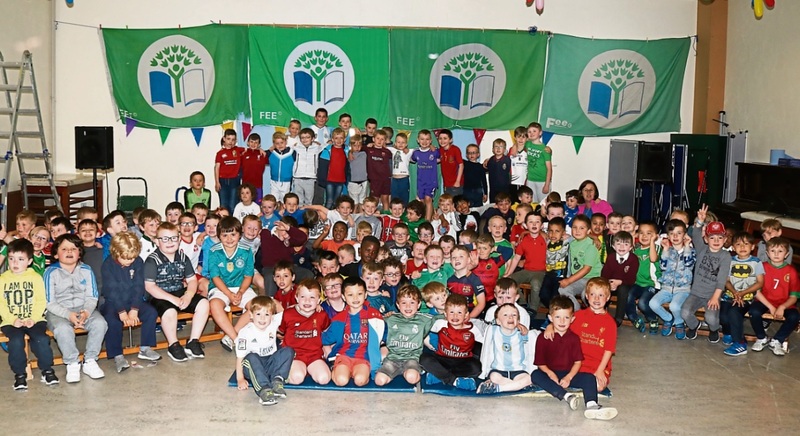 Former pupils and Na Piarsaigh men Shane Dowling and Kevin Downes visited their old primary school to celebrate the achievements of pupils and staff this year, as the school was presented with the ISPCC Anti-bullying Flag. For promoting a culture of positive mental health among students this year, the school has received the ISPCC Anti-bullying Flag, the Kindness Flag, the Amber Flag, the Mental Health Awareness Flag and the Active Flag. Both Dowling and Downes believe that positive mental health starts with physical activity, they told the boys. “Some people could leave school on a Friday and they won’t see daylight again until they come to school again on Monday morning because they’ll stay inside playing video games,” Dowling said. “If you bury yourself in headphones when you go home from school until you go to bed, which is happening quite a lot, personally I believe that has a lot to do with causing mental health problems. Downes also encouraged the young students to get out and get active. “Whatever you’re interested in, whether it’s hurling, football, golf, whatever it might be; just get out and get active. It's the best thing ye can do. Playing in a team can help promote positive mental health, he added. As the ISPCC Anti-bullying Flag was unveiled, students celebrated in the school hall with a ceremony full of song and laughter. Also in attendance was former Minister for Education and Limerick City TD Jan O’Sullivan. “I’m just so impressed. A fantastic school, with all the different things that you are doing. It's so important to be happy in school,” she told pupils. “And having all these different things going on really helps make young fellows happy in school,” she added. “This is such an achievement for the school,” teacher Sinead Dore said. “We’re very proud of them, it's a fantastic achievement,” principal Patrick Millane said.